This article was first published online by Seedstock.com on February 9, 2012. University of Florida researchers used the caterpillar of the Giant Swallowtail butterfly, shown here on a lime plant, in experiments to show the essential amino acid methionine, when sprayed on leaves, is 100 percent effective in killing larvae within two to three days. Scientists used the Giant Swallowtail as a surrogate for the Lime Swallowtail, an invasive species from southern Asia discovered in the Caribbean in 2006. Researchers say the Lime Swallowtail’s potential impact on the U.S. citrus industry is cause for serious concern. The study appears in the current issue of the Journal of Economic Entomology. Florida Museum of Natural History photo taken July 23, 2007, by Delano Lewis. What if agricultural pests could be managed by an essential nutrient, found in all proteins, that poses no environmental threat, naturally biodegrades, and potentially could be beneficial to plants? Physiology and genomics professor, Bruce Stevens from the University of Florida thinks he just may have stumbled onto the future of green pesticides. It turns out when applied to the leaves of plants, methionine—one of a dozen or so essential amino acids found in literally everything that we eat—does a remarkable job of defeating destructive caterpillars, nematodes, mosquitoes, and a potential host of agricultural pests. Amino acids are the building blocks of proteins and play key roles in metabolic processes. The human body can only produce about half of the 20 or so amino acids that it needs. The rest, so-called essential amino acids, must be supplied by diet. Methionine is one such essential amino acid that all mammals must eat every day. Ironically, this vital component of life as we know it, may be the next best thing in pesticides. In the laboratory, Stevens isolated one particular gene found in the tomato hornworms that acted as a gatekeeper for a molecular highway traveled by electrolytes and amino acids. For some reason, when he added one particular amino acid, methionine, to the system, the highway broke down. This mechanism does not occur in humans or other animals and although it yielded little information to further medical research, it brought valuable new light to caterpillar biology. “This was one of those serendipitous things that happens in science, once in a while,” Stevens says. Curiosity led him to wonder what would happen if he fed the methionine directly to the caterpillars. “I got some good old tomato hornworms and fed them the methionine and sure enough, just like the Raid ad, it killed them dead,” Stevens says. Since then, he has tested the methionine on several other destructive caterpillars and the Colorado potato beetle. Most recently, Stevens has teamed up with Delano S. Lewis, a post-doctoral researcher at the University of Florida specializing in butterflies and moths to see if methionine could help resist an invasion of caterpillars that have become quite the nuisance in the Caribbean. The lime swallowtail butterfly’s native habitat is tropical and southern Asia, but in recent years has popped up in Jamaica, the Dominican Republic, and Puerto Rico. 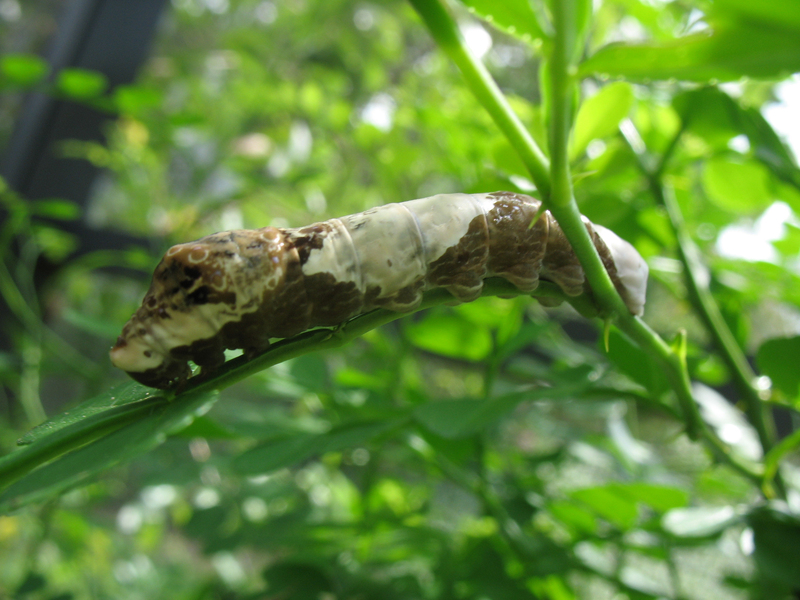 Lime swallowtail caterpillars prefer the leaves of lime trees, but can be detrimental to all citrus trees. Delano expects that it is only a matter of time before these caterpillars make their way from the islands to Florida, threatening the Sunshine State’s citrus industry. Stevens and Lewis were delighted to find that methionine had the same effect on these invasive caterpillars as well. Stevens says that the methionine can be mixed with either water or an agricultural agent used to make pesticides and fertilizers stick to the surface of plants. The solution is then sprayed on the leaves of plants. Once the caterpillar takes a bite, the methionine goes to work in the caterpillar’s intestine. “It apparently seems to go to work pretty fast. They just become arrested in their growth, dry up, and die, leaving the plant leaves mostly untouched,” Stevens says, adding that the plants themselves remain just as robust as they ever were. He found that some ornamental plants even flowered better after a dousing of methionine. Stevens sees tremendous potential for the agricultural industry. While methionine can be found in food and in nutritional supplements, it will have to pass through some hoops before it hits the shelves as a pesticide. With the support of the university, Stevens has sought two patents on the use of methionine as a pesticide. The company Phoenix Environmental Care, a pesticide manufacturer and distributor, headquartered in Georgia, has purchased a license allowing production of methionine-based pesticides. The EPA requires that a third-party company analyze potential impacts on the environment and wildlife. Stevens does not foresee any detrimental side effects arising from the application of methionine. His research has found that even the lethal dose of methionine does not affect natural predators. Since bees do not eat leaves, they would not likely ingest the methionine. As an essential nutrient for animals, it is unlikely that it will be found to be harmful to other critters that could ingest sprayed leaves as well. Stevens hopes that methionine can become a key component of Integrated Pest Management, reducing the need for harmful pesticides.